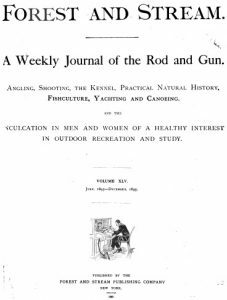 Click on the link below to explore the first article from a series published in Forest and Stream titled: How Fur is Caught I 1895. This late 19th century publication contains detailed descriptions of trapping, logging, winter survival and hunting. Most of the article is based in the Mercer area with detailed preparation and explanation regarding a week long trapping adventure. As the story begins, we are introduced to Fay Buck, the 21 year old trapper and honored woodsman. Buck’s family will establish Buck’s Resort in Manitowish Waters as well.